The young Renoir, that almost had no money to but paint wouldn’t imagine that, in the future, he will be acknowledged as one of the maximum exponents of the impressionism. Despite beginning his artistic career as a teenager, the recognition only would came after 10 years of work, when he could hang 6 of his paintings in the first Impressionist Exhibition of 1874 that, in that time, was considered an “alternative” exhibition from formal and academic art. But the restless Renoir was always looking for new ways of expressing himself and, from 1881, he travels to Algiers and Italy. In the Mediterranean, he is shocked by the works by Titian and starts to think that his own work must regain the “grandeur and purity” of classical art. And there is when The umbrellas is significant. In this transition from the impressionism to a more traditional painting, today’s work is considered an experiment that lasted for 6 years to be completed. As we see, is a street scene where the characters, under a clouded sky, protect themselves from rain under their umbrellas. To begin, the composition is odd. Instead of a balanced composition, The umbrellas seem more like a snapshot than a painting, as the characters on the sides are violently cut-off. If we look closer, we can also see that the work was painted with different techniques: while the loose brushstrokes and the bright colors of the girls at the right and the trees of the background are purely impressionists; the compact lines and the dull colors of the woman of the left and the umbrellas are evidently more classic and traditional. But Renoir is still Renoir and he keeps his interest in beauty and, specially, feminin sensuality. 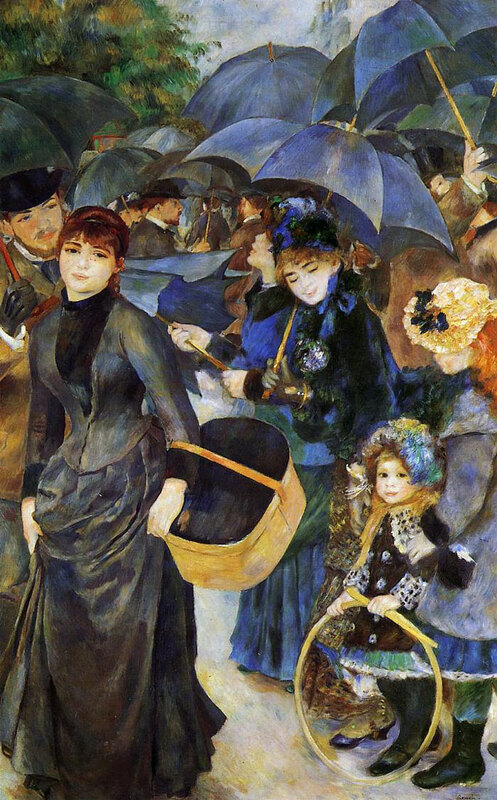 Both the curvy woman on the left and the little girl looking at the spectator, highlight Renoir’s concern for the female figure, just like the old masters of classical art. ~ by Álvaro Mazzino on November 1, 2010. Hello, please inform us when we shall see a follow up! On her person, she has the all-black crossbody Chanel Boy Bag, an all-white Rochas Leti Tote and a third black-and-white mystery bag. Chanel bags are of course available at Chanel boutiques and high-end department stores, and you can shop Rochas at Net-a-Porter. This entry was posted on November 1, 2010 at 10:24 and is filed under Impressionism.You can follow any responses to this entry through the RSS 2.0 feed.You can leave a response, or trackback from your own site.